Shaun of the Dead has a lot to answer for. Ten years ago, the guys behind Spaced invented a new genre hybrid that got everyone excited: the rom-zom-com. Since then, filmmakers with less brains and far less affection for the zombie genre, have attempted to make their own mash-ups of Romantic Comedies with Zombies. Most notable (and frustrating) was Warm Bodies that had Nicholas Hoult as a zombie who did thinking, as evidenced by his wry comedic voiceover. Now comes Life After Beth, a film that features a zombie who looks like Aubrey Plaza, talks just fine and doesn’t even realise she is dead for much of the movie. Zach’s (Dane DeHaan) girlfriend Beth (Plaza) is out hiking alone when she is bitten supposedly by a snake. Zach bonds with Beth’s grief stricken parents until one day he realises they are avoiding him. Suspecting something is up, Zach peeks in the window’s of Beth’s home to find she is alive and well and being kept indoors by her protective parents. But despite appearances, Beth isn’t alive after all. She has returned from the grave and is actually slowly decomposing into the kind of zombie that genre fans know and love. Zach and Beth were having relationship problems before her apparent death but now their renewed love soon descends into a whole new level of complications as Beth begins to rot, both physically and mentally. First up, zombies should never, ever talk. They shouldn’t think, have voiceovers relaying their thoughts, or have coherent chats with the living. They are dead. Brain dead pure and simple. Even when godfather of the zombie genre, George A. Romero started having one of his monsters utter the odd word in Day of the Dead, things took a turn for the decidedly less horrifying. 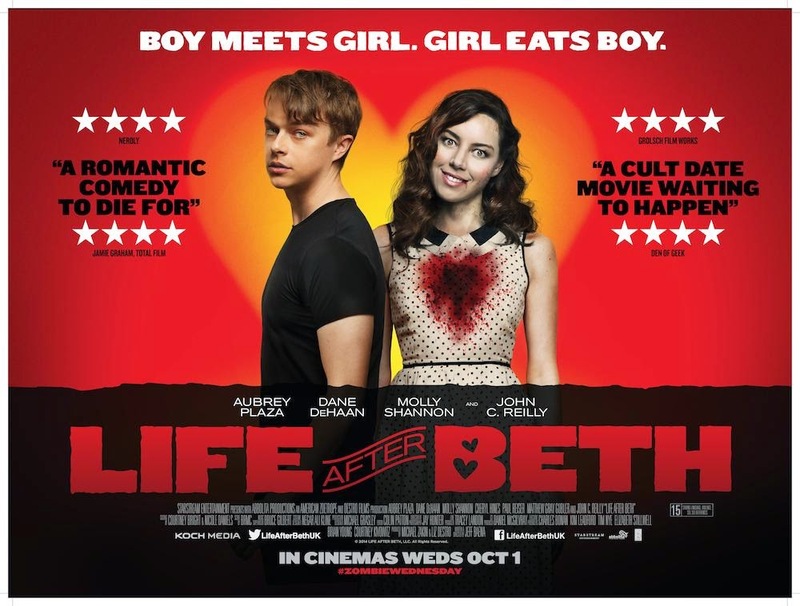 Like Warm Bodies before it, Life After Beth then is far more for the rom-com crowd than for horror fans. It is not, as with Shaun of the Dead, a zombie movie that just had a boy and a girl with some comedic relationship troubles in it. Instead it is a romantic comedy where the girl happens to be slowly turning into a zombie. Everyone who has ever seen a zombie movie will know that people get bitten and then slowly or speedily die from the wound. They then return from death as zombies. So why does Beth rise from the grave like she never died and then slowly deteriorate into a zombie after her death? It’s like writer and director Jeff Baena either hasn’t seen a zombie movie or simply doesn’t care about the rules. However, those who after romantic comedy may not care either. What is even more frustrating though is that Aubrey Plaza is easily the best thing in the film, especially when towards the end, she starts to go full zombie. Watching her staring, chewing, thrashing and stumbling is far more fun than anything in the majority of the rest of the film, so why it takes her so long to get this way is a mystery. The sight of her stumbling along with a cooker strapped to her back, smooth jazz playing from a stereo around her neck (don’t ask) is pretty much worth the price of admission alone. The rest of the film cannot hope to live up to Plaza’s performance in the final act. Despite the cast including Dane de Haan, John C. Reilly, Paul Reiser and Anna Kendrick, who is completely wasted in just a pair of pointless scenes, the story simply shuffles along with very few big laughs and certainly no real scares. Perhaps it has something mildly amusing to say about love and relationships as the young lovers’ passion turns to resentment, but mostly Life After Beth falls flat on its face. While it’s fun seeing Plaza fly into rages, her mood violently swinging as she decomposes, oddly for a film where a zombie spends the majority of the film seeming far too alive and well, Life After Beth is sadly lifeless. For Aubrey Plaza’s performance when she turns full zombie. If you want to see what it’s like to have a girlfriend with really terrifying mood swings.